Tickets for the 2019 Reel Fun and Festivus are on sale now! For out of town purchases you can order via credit card. You will need to contact Top O' Michigan at the number listed below. Sorry, but we do not reserve tickets for on-ice pick up. Entry fee for the tournament is $25.00 per hole. Festivus tickets are $20 each. 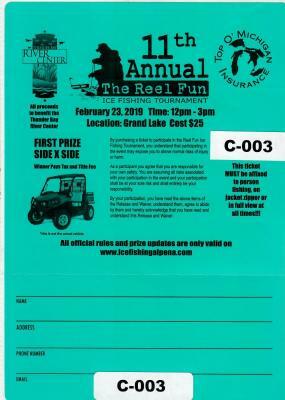 All checks must be made payable to the Northeast Michigan Community Foundation (mark Fishing Tournament in the memo area).